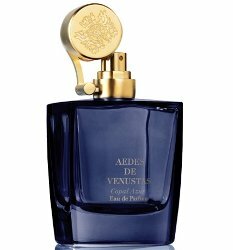 West Village niche perfume boutique Aedes de Venustas will launch Copal Azur, the brand's fourth fragrance. Copal Azur was developed by perfumer Bertrand Duchaufour and centers on the Mayan incense resin copal. Other notes include ozonic and salty notes, cardamom, patchouli, amber, frankincense, myrrh and tonka bean. Aedes de Venustas Copal Azur will be available in 100 ml Eau de Parfum or in a purse spray with three 10 ml refills. Strikingly similar to frankincense, copal, whose name means “incense” in Nahuatl, can be extracted from a variety of trees native to Central and South America. And much like frankincense in Ancient Egypt or Greece, it was burned by the Mayans and Aztecs to “feed” the gods. Today, it is still used in Mexico for spiritual purposes. Karl Bradl was drawn to its scent while cycling on the coast of the Yucatán Peninsula through copal-laced air towards the natural reserve of Sian Ka’an, which translates as “Gate to Heaven”. The suave cloud of burning copal whirling over Tulum's bohemian and eco-chic outdoor locales at the foot of an ancient Maya walled city, confirmed his inspiration for Copal Azur. The vibrant hues of the Mayan Riviera filter through milky, pine-scented wreaths of burning resin. Blue, for the Caribbean Sea and the limpid depth of the cenotes, the subterranean fresh-water pools that riddle Yucatan: a cool breeze of ozonic and salty notes. Green, for the lush Mexican jungles: a flash of cardamom glinting in the moist, woody undergrowth of patchouli and myrrh. White, for the purest quality of copal and the pristine beaches of Tulum: a lick of almond-scented tonka bean smoothed into creamy notes. Amber for the Jaguar God of Terrestrial Fire – the fire that burns the sacred copal… Hypnotic, spiritual and forceful, Copal Azur might well indeed open the “Gate to Heaven”. Well, that’s a fast new launch after their Oeillet Bengale, no? It seems like it, but not sure when this will actually go on sale. True, there is no specified launch date. I visited Aedes stand at Pitti and this perfume wasn’t displayed on their stand while I saw in reports from others that they were given a chance to try it. It does seem fast! But everything has been great in the line, so I’m looking forward to it. Bengale is darned good…I’d wear it in any season:). Their scents have been top notch, don’t care for aquatic/ozonic notes but if a line could make it work for me..it would be this one. Can’t wait to try this one, and that bottle in blue is terrific. Reminds me of my trip to Belize to visit my MIL’s family. I brought back a big hunk of copal I bought in a shop but haven’t ever burned it. I should break it out soon! Denyse of Grain de Musc said they are planning on a release every 6 months, so this must be their Christmas release. I am very anxious to get my mitts on this, as it is an incense scent and I am an incense fangirl big time. Okay, I just called Aedes – release date is Oct. 15th according to the person who answered the phone. Woohoo! I am sure this will be absolutely fabulous! I have the Bengal and I adore it. Does anyone know why true copal cannot be used in perfume? Or is that just advertising talk? I don’t know, but it would be strange if it was “advertising talk” to say that the material you’ve named your perfume after isn’t in the perfume? More likely you’d do the opposite, lie and say it’s in there when it isn’t. I recently bought a bottle and think it’s fantastic.Here is my review-Copal Azur by Aedes De Venustas and created by Bertrand Duchaufour is a new and fascinating take on the incense genre. Bertrand Duchaufour has created many memorable incense perfumes including Aedes’s own eponymous scent and the famous Avignon by Commes des Garcon.Here he creates a new genre.I’d call it “Tropical Incense” or “Oceanic Incense”.Too often these days are the launches of perfumes accompanied by marketing drivel and florid descriptions that rarely live up to the hype.Descriptions of exotic locales, rituals and rare ingredients fall flat as the reality is far different from the promised journey.Copal Azur is one of the few perfumes I’ve found that indeed does take you on the promised journey and what a journey it is.Designed to recall the juxtaposition of the scared Mayan incense Copal,the lush oceanic locale of Tulum,and the verdant Mayan jungle,Copal Azur starts with a powerful blast of incense apparently constructed from 3 different extractions of Frankincense as Copal itself is not used as a perfumery ingredient.The opening is eye- wateringly strong.Behind the incense lurks a marine like ozonic note but don’t worry aquatic phobes there’s no Calone like note here.Because of that the incense has less of a Catholic or liturgical feel. It’s more of a dry/bitter green ozonic note,almost chlorine like with a salty element.It has an airy and crisp feeling like staring into the depths of a deep blue cenote.Since cenotes usually occur at a fresh and salt water interface this makes perfect olfactory sense.Think of it as a salty fresh note,maybe Floralzone?.After a few minutes a tropical note begins to creep in.This is the note of the Mayan jungle.It is the scent of a distant jungle rot with a spicy sweet green accent provided by the Cardamom.Bertrand Duchaufour used a similar note in his excellent Aurore Nomade for The Different Company.In Aurore Nomade the floral element was turned up and accented with rum and spices.Here it’s much drier and airier.It’s like the distant humid veneer of the jungle made drier by the incense and ozonic notes.At this point Copal Azur really does provide a remarkable realistic feeling of being on the beach in Tulum surrounded by a cloud of burning copal resin.As the perfume reaches it’s middle stages it becomes slightly sweeter as the notes of Tonka bean and Amber make an entrance. The amber is meant to represent the fire that burns the sacred Copal. That sweetness is tempered by the patchouli and the Myrrh and the resinous smell of the Copal still swirls like a sweet smoke holding everything together.As Copal Azur dries down the notes meld seamlessly into each other into a resinous salty/fresh tropical blur.With a polite sillage and excellent longevity this is a must try for incense lovers and those that enjoy fresh tropical salty scents.It’s a new and daring take on incense.I truly enjoyed the journey.Bravo Bertrand Duchaufour and Aedes De Venustas!